Croatia finished third at the past three consecutive major tournaments, the EHF EURO 2012, the 2012 Olympic Games and the World Championship 2013, but they are now willing to achieve more. In a first step the teams two assistant coaches, Zeljko Babic and Zdenko Zorko, were replaced. New on the sideline next to head coach Slavko Goluza is Zdravko Zovko. The former Croatian and Yugoslavian international won gold at 1984 Olympic Games in Los Angeles. He was also part of the Croatian team that won bronze at the EHF EURO 1994 and silver at the World Championship 1995. 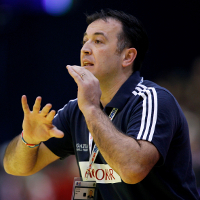 As a coach he steered Veszprem into the final of the EHF Champions League in the 2001/02 season. He has also coached Croatia's women's team previously. Croatia's new goalkeeper coach is two-time Olympic champion (1996 Atlanta and 2004 Athens), Valter Matosevic. He is currently coaching HC Zamet and was the Croatian junior national team's goalkeeper coach at the Youth World Championship this summer in Hungary at which Croatia won silver. This means that together with Goluza (Olympic champion in 1996 and 2004) three Olympic champions with a combined tally of five gold medals are at the helm of the Croatian team. Furthermore Goluza has announced the players he is going to take to the inaugural edition of the Men's Golden League which will throw off on 1 November in Oslo, Norway. Croatia face Norway, Denmark and France in the four-nation tournament that lasts for three days. ''There are no big changes for the Golden League and there will be no big changes either in the national team's roster for the European Championship,“ said Goluza. “There is no time to make any major changes. We'll do our best to make our game better in some details and to keep what was good in the past. At the EHF EURO 2014 in Denmark Croatia were drawn in Group D together with Sweden, Belarus and Montenegro. “We respect each team very much. Playing against Sweden in Copenhagen will be like playing against a home team, and they are playing nice handball as they proved at the Olympic Games in London,” commented Goluza. “Montenegro are something new for us but they are definitely a good and ambitious team. They overcame Germany in their qualification group with which says enough for itself. “Belarus have showed improvement at the World Championship Spain which is also visible in their club handball and their league. Wing players: Manuel Strlek, Lovro Sprem, Ivan Cupic, Zlatko Horvat.